2-inch quadruplex video tape (also called 2″ quad, or just quad, for short) was the first practical and commercially successful analog recording video tape format. It was developed and released for the broadcast television industry in 1956 by Ampex, an American company based in Redwood City, California. The first videotape recorder using this format was built and created in the same year. This format revolutionized broadcast television operations and television production, since the only recording medium available to the TV industry before then was film used for kinescopes, which was much more costly to utilize and took time to develop at a film laboratory. In addition, kinescope images were usually of obviously inferior quality to the live television broadcast images they recorded, whereas quadruplex videotape preserved almost all the image detail of a live broadcast. Since most United States West Coast network broadcast delays done by the television networks at the time were done with film kinescopes that needed time for developing, the networks wanted a more practical, cost-effective, and quicker way to time-shift television programming for later airing on the West Coast than the expense and time consumption of the processing and editing of film caused. Faced with these challenges, broadcasters sought to adapt magnetic tape recording technology (already in use for recording audio) for use with television as well. The term "quadruplex" refers to the use of four magnetic record/reproduce heads mounted on a headwheel spinning transversely (width-wise) across the tape at a rate of 14,400 (for 960 recorded stripes per second) rpm for NTSC 525 lines/30fps-standard quad decks, and at 15,000 (for 1,000 stripes per second) rpm for those using the PAL 625 lines/25fps video standard. This method is called quadrature scanning, as opposed to the helical scan transport used by later videotape formats. The tape ran at a speed of either 7.5 or 15 in (190.5 or 381.0 mm) per second for NTSC 525/30 video recording, or 15.625 in (396.875 mm) per second for PAL 625/25 video; the audio, control, and cue tracks were recorded in a standard linear fashion near the edges of the tape. The cue track was used either as a second audio track, or for recording cue tones or time code for linear video editing. A typical 4,800 ft (1,463 m) reel of 2 in (51 mm) quad tape holds approximately one hour of recorded material at 15 inches per second. The quadruplex format employs segmented recording; each transversely recorded video track on a 2-inch quad videotape holds one-sixteenth (NTSC) or one-twentieth (PAL) of a field of video. (For NTSC systems, the math suggests 15 transverse head passes, each consisting of 16 lines of video, are required to complete one field.) This meant that 2-inch quad did not support "trick-play" functions, such as still, shuttle, and reverse or variable-speed playback. (In fact, the quadruplex format could only reproduce recognizable pictures when the tape was playing at normal speed.)) However, it was capable of producing extremely high-quality images containing about 400 horizontal lines of video resolution, and remained the de facto industry standard for television broadcasting from its inception in 1956 to the mid-1980s, when newer, smaller, and lower-maintenance videotape formats superseded it. Super high-band, which used a pilot tone for better timebase stability, and higher coercivity tape. Most quad machines made later in the 1960s and 1970s by Ampex can play back both low and high-band 2-inch quad tape. Time-shifting of television programming for the West Coast of the United States by the networks in the 1950s (in order to broadcast their programming at the same local time on the East and West Coasts) using kinescope films was quite a rushed and perilous ordeal. This was because there were only three hours for the West Coast branches of the TV networks to receive video for the programming from the East Coast (live via leased microwave relay or coaxial cable circuits provided by the phone company (AT&T) at the time), and then to record such to kinescope films, and finally to develop the film to be aired three hours later on the West Coast. This usually meant the kinescope was aired almost immediately after it came straight out of the developing equipment, still warm from the film dryer. These were referred to by the networks as "hot kines". By 1954, the networks used more raw film stock for kinescopes than all of the Hollywood film studios combined, spending up to $4,000 per half hour. They were desperate to obtain a quicker, less expensive, and more practical solution. In the early 1950s, Ampex and several other companies such as Bing Crosby Enterprises (BCE) and RCA were competing to release a videotape format. RCA and BCE did release working prototypes of their recorders, but their downfall was that they all used a longitudinal (stationary-head) method of recording, much like audio tape recorders. 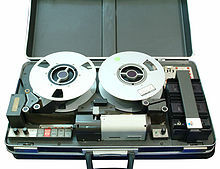 This meant that the tape had to be recorded at an extremely high speed (around 120 in/s (3,048 mm/s)) in order to accommodate sufficient bandwidth to reproduce an adequate video image (at least 2–3 MHz for a watchable image), in turn requiring large amounts of tape on large reels. 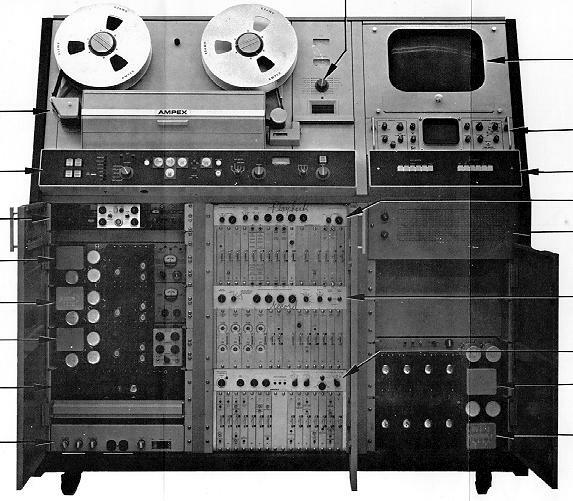 At the same time, the BBC developed a similar stationary-head video tape recorder (VTR) system that saw some on-air use, called VERA (Vision Electronic Recording Apparatus). Ampex, seeing the impracticality of the prototype BCE and RCA VTRs, started to develop a more practical videotape format with tape economy in mind, as well as providing a solution to the networks' West Coast delay woes. 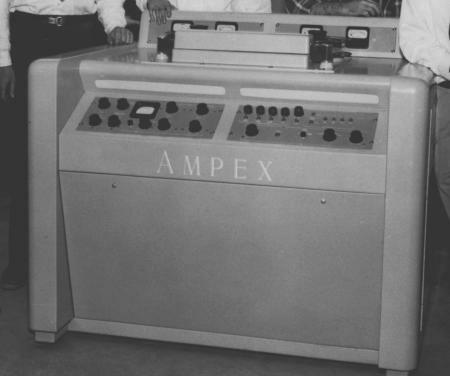 Starting in 1952, Ampex built the Mark I prototype VTR, using 2 in (51 mm)-wide tape. Ampex decided that instead of having the tape move at high speed past a stationary head to record enough bandwidth for video, the head would be made to move rapidly across the relatively slow moving tape. 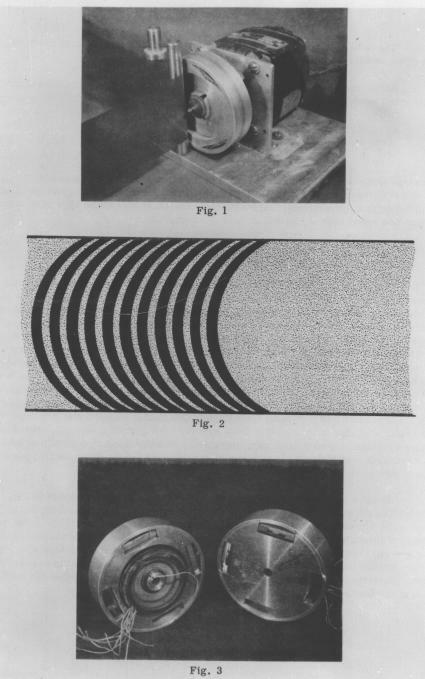 This resulted in the Mark I using arcuate scanning, which consisted of a spinning disk with a face (where the heads were mounted) which contacted the tape (as opposed to the edge of the headwheel with transverse quadrature scanning). This resulted in an arc-shaped track being recorded across the width of the tape. Arcuate scanning resulted in a head-to-tape speed of about 2,500 in/s (63,500 mm/s), but problems with timebase stability of the reproduced video signal from the tape led Ampex to abandon arcuate scanning in favor of the more reliable transverse scanning system. Ampex continued through the mid-1950s with the Mark II and Mark III prototype recorders, which now used transverse scanning. 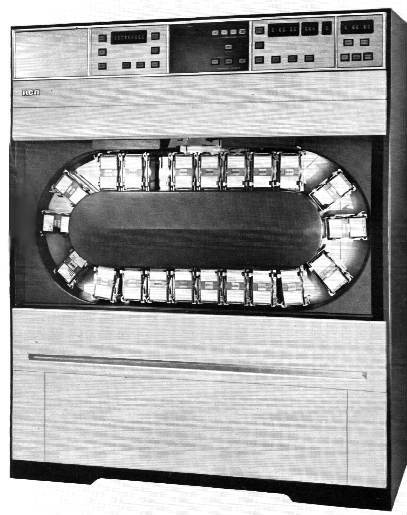 The Mark II used frequency modulation for recording video to tape, resulting in a much-improved, but still noisy, video image (the Mark I had used amplitude modulation, which resulted in a very poor-quality video signal reproduced from the tape, compounded as well by the shortcomings of the machine's arcuate scanning). The Mark III had improved signal-processing and servo electronics, resulting in much better video reproduction. The Mark III worked well, but its appearance was quite that of a prototype, and not a finished, saleable product. It was in a makeshift wooden case, with several parts of its chassis externally mounted in partially filled racks. Ampex then built the Mark IV by putting Mark III components into a sleek metal console and fully populated rack-mount cases. 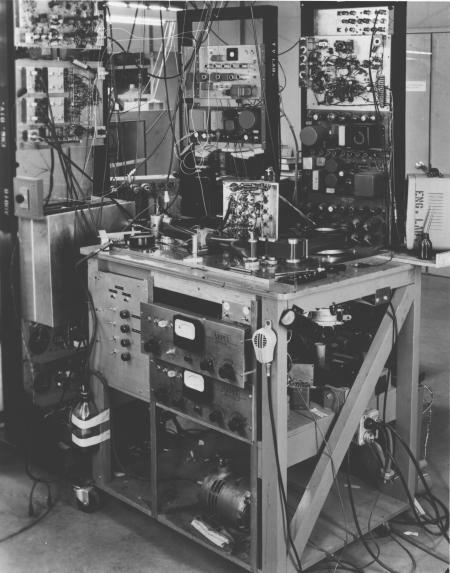 The Mark IV was the machine first publicly demonstrated at the National Association of Radio and Television Broadcasters (now the NAB) convention (the NAB Show) in Chicago on April 14, 1956. After William Lodge of CBS finished his speech, the Mark IV replayed his image and words almost immediately, causing "pandemonium" among the astonished attendees. 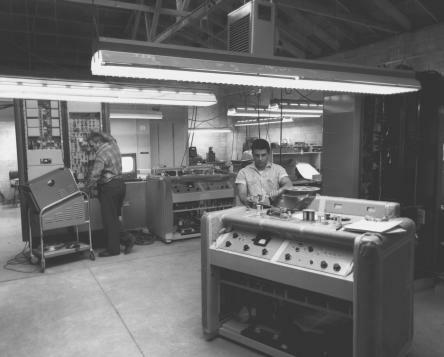 The earlier Mark III was given some cosmetic improvements, and was also demonstrated at Ampex headquarters in Redwood City the same day. Both demonstrations were a success, and Ampex took $2 million in orders for the machine in four days. 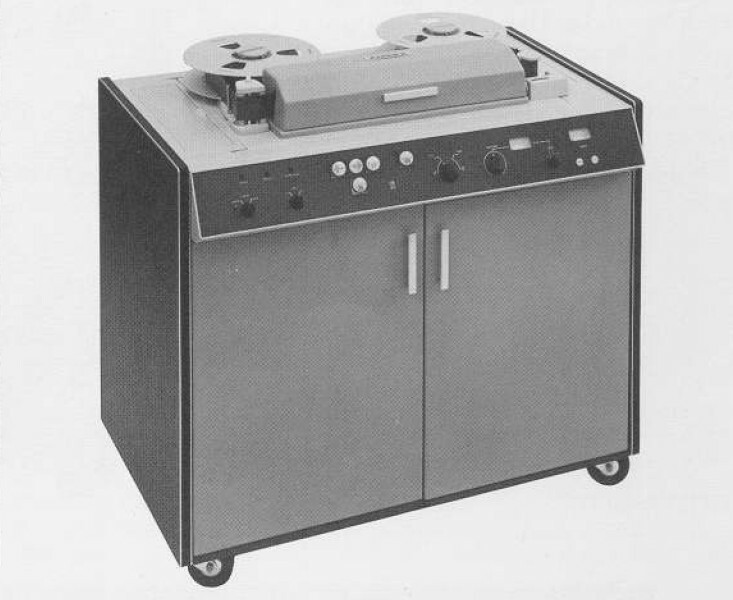 Ampex later released the first manufactured models of quad VTR based on the Mark IV which were also prototypes, the VRX-1000, of which 16 were made. Machines made afterward were the final production models, and were designated as the VR-1000. The advertised price for the Ampex Videotape Recorder in late 1956 was $45,000 (equivalent to $415,000 in 2018). In 1957, shortly after Ampex's introduction of the 2-inch quad format, RCA introduced a quad-compatible VTR, the TRT-1A. RCA referred to it as a "Television Tape Recorder", since the word "videotape" was a trademark of Ampex at the time. 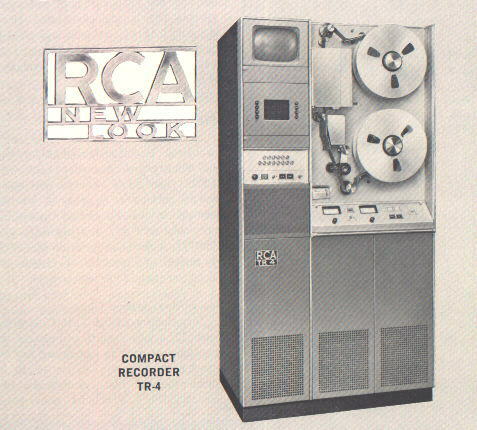 RCA was able to make the TRT-1A and its later machines compatible with 2-inch quad because Ampex assisted RCA in doing so, as an expression of gratitude for RCA assisting Ampex with making their later quad machines after the VR-1000 color-capable. Initially, the VR-1000 was only natively capable of recording and playing back black and white video, but RCA had modified several VR-1000s to record color video for the NBC TV network (which RCA owned at the time) in the late 1950s, since NTSC color video programming was already underway at NBC. 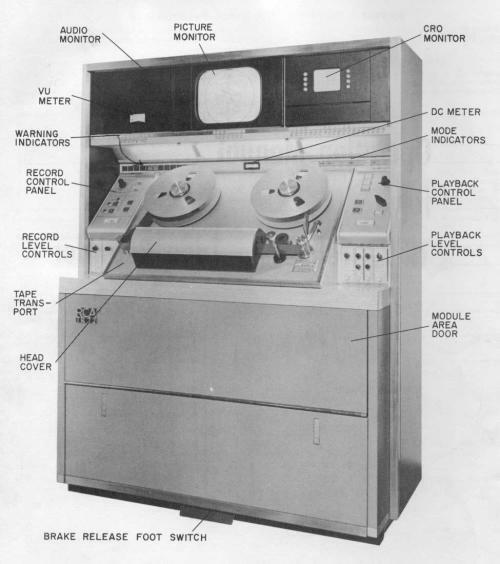 Ampex developed and released updated and improved models of their quad decks, beginning with the VR-1000B in mid-1959. At that time, Ampex advertised that some 360-plus VR-1000s had been sold worldwide, more than 250 in the U.S.—roughly 30 at each network, 100 by independent stations, and 20 by production companies. The second-generation VR-2000 appeared in 1964. followed by a scaled-down economy version, the VR-1200, in 1966 and the AVR series of VTRs, AVR-1, AVR-2, and AVR-3 in the 1970s. The AVR-2 was the most compact of quad VTRs, using conventional 120 volt (V) single-phase household-type AC power to operate, rather than the 208 or 220 V three-phase AC power required by larger quad machines. RCA released later models of quad VTRs as well, such as the TR-22, TR-70, and TR-600. 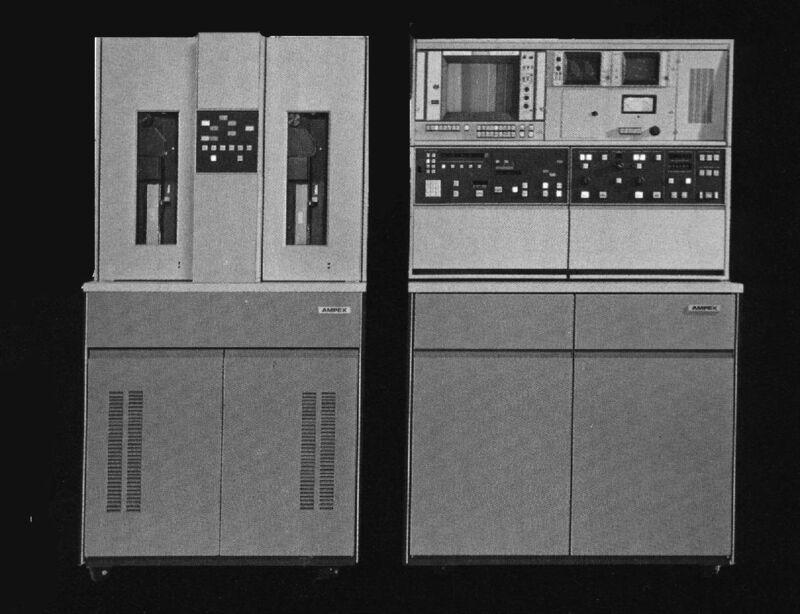 The Fernseh division of Bosch in Germany released the BCM-40 quadruplex VTR in the 1970s. It was only marketed in Europe, and was not sold in the U.S.
CBS was the first television network to use 2-inch quad videotape, using it for a West Coast delay of Douglas Edwards and the News on November 30, 1956. The CBS show Arthur Godfrey's Talent Scouts on December 24, 1956 became the first entertainment program to be broadcast live to the nation from New York and taped for a time-delayed rebroadcast in the Pacific Time Zone. On January 22, 1957, the NBC game show Truth or Consequences, produced in Hollywood, became the first program to be broadcast in all time zones from a prerecorded videotape. The Edsel Show, on October 13, 1957, was the first CBS entertainment program to be broadcast live to the nation from Hollywood, then tape-delayed for rebroadcast in the Pacific time zone. 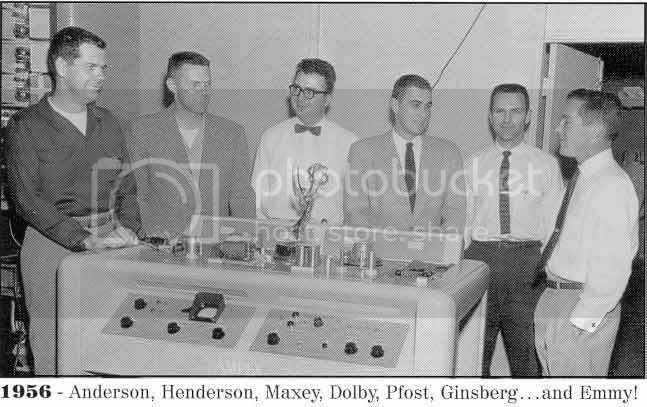 The engineers at Ampex who worked on the development of 2-inch quadruplex videotape from the Mark I to the VR-1000 were Charles Ginsburg, Alex Maxey, Fred Pfost, Shelby Henderson, Charlie Anderson, and Ray Dolby (who later went on to found Dolby Laboratories). 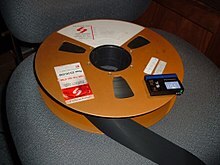 At first, editing was accomplished by physically cutting and splicing the 2" magnetic tape. The tape was "developed" using a solution of fine iron powder suspended in a liquid solvent, marketed as "Edivue" Magnetic Developer. Using a special splicing block (such as the then-industry standard Smith Splicer) equipped with a microscope to view the developed tracks, the editor could then see their patterns and then cut between them. Some 2" splicing blocks instead used a read-only tape head connected to an oscilloscope that enabled the editor to electronically view cue tones or the control track pulses on the tape to determine where the tape should be cut. See linear video editing for details. Ampex developed and introduced all-electronic videotape editing, making the physical splicing of videotape practically obsolete, with its breakthrough Editec system in 1963; by recording cue tones on the tape, the editor could make frame-accurate edits. RCA had an "electronic splicer" in their TR-4/5 and TR-22 VTRs for frame-accurate edits. 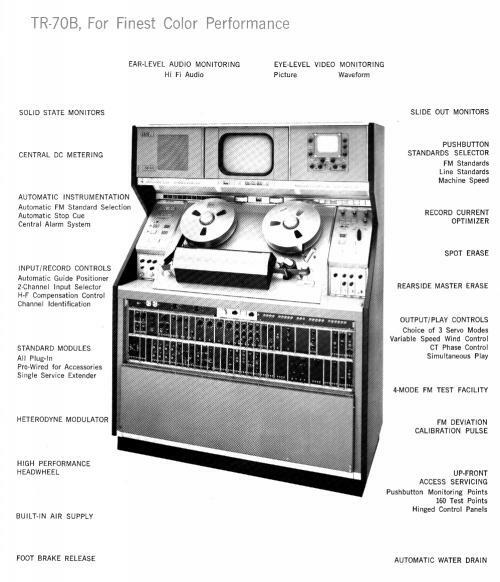 In 1967 EECO created and introduced the EECO-900 edit controller, which used their proprietary On-Time time code (the later and more standard SMPTE time code had not yet been developed), which was used in conjunction with the quad machines of the time, and was the successor to Ampex's Editec. The EECO-900 and On-Time timecode were developed from EECO's previous work and products developed for NASA for logging and timecoding of their telemetry tapes during space missions. In 1971, CMX, a collaborative between CBS and Memorex, introduced the first computer-based edit controller using SMPTE time code for editing. The CMX 200 could control both the source (A-roll) and record (B-roll) quad VTRs. CMX continued to make more powerful edit controllers capable of controlling more VTRs and peripheral devices, such as switchers, DVEs and character generators. 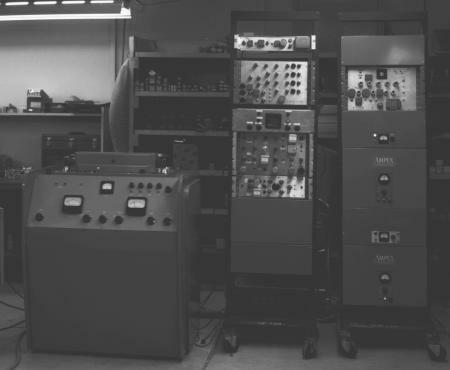 In 1976, Robert Bosch GmbH introduced the Mach One list-management edit controller, a lower-cost (and less powerful) post-production alternative to CMX edit controllers. At the time, both CMX and Bosch edit controllers utilized similar DEC computers as their basic hardware. 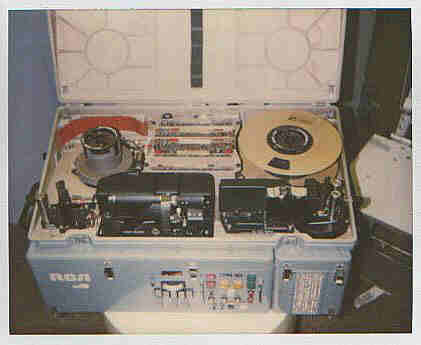 As 1" Type B and 1" Type C VTRs came on the market, list-management editing bays sometimes used a combination of both 1" and 2" VTRs; however, 2" VTRs soon began to disappear from both broadcast and post-production facilities, as the newer 1" machines were smaller, more dependable, used tape that was far less expensive to purchase, and were capable of recording stereo audio tracks. VR-1000 (1956) (VRX-1000) FM Low band, three racks of tubes, monochrome. No timebase correction. VR-1000 "Allen" or "Allenized" update kits (made for Ampex by Steve Allen at Allen Electronics) to color solid state, FM high band updateable, solid state servo system. VR-1001 VR-1000 with the transport vertical. VR-2000 (1964) Solid state, first color-capable quad VTR with high band. Optional Editec, Dropout compensation. Mark 10 head. Analog TBC. VR-1195 (1966) VR1100 with many Ampex updates. VR-1200 (1966) Solid state, color high-band. Analog TBC. Optional Editec. Scaled-down economy version of the VR-2000. VR-3000 (1967) Portable VTR with a Mark 11 ball-bearing head. All-format VTR (NTSC/PAL/SECAM, 15 IPS/7.5 IPS, high-band/low-band). Digital TBC was possible, but required extensive mechanical modifications to the basic unit. Battery- or line-powered. VR-3000B Portable VTR Improved version of VR-3000. Digital TBC was available as a plug-in accessory, and required no modifications to the basic unit. Improved batteries. AVR-1 (1973) Very fast VTR, vacuum columns, vacuum capstan, air transport. NTSC/PAL switchable. Analog TBC. ACR-25 (1974) Cart VTR, with two AVR-1 type decks. ACR-25B (1975) Cart VTR, ACR-25 with AVR-2 digital TBC. AVR-2 (1974) Digital TBC, compact Quad used in studios and remote trucks. Uses 110-volt single-phase AC (other quad models require 220-volt or 3-phase AC service, although the AVR-2 can be wired for either 110- or 220-volt service). AVR-3 (1975) Last Ampex Quad, digital TBC. Vacuum capstan. Super high band. Amtec: Horizontal TBC. All that was needed for B&W playback. Colortec: Color TBC in line after the Amtec for color playback. Editec: (1963) Cue tone editor for frame accurate editing. Velcomp: Color velocity TBC correction for better color playback. Optional on some models. Procamp: Processing amplifier on the final output. New composite sync insertion, level adjustment. Note: all quad VTRs have a procamp so as to obtain a standardized output from a recording. Ampex procamps were occasionally used to clean-up, hence to standardize network feeds. Dropout compensation (DOC): Replaced snowy video spots where the FM signal on the tape is missing momentary, caused by a defect in the tape. Optional on some models, both Ampex and 3M made different models of DOC modules for quad VTRs that can interface with such. The components of the VTR were the servo system, video record (modulator) and playback de-modulator) and power supply. TRT-1A (1957) Tube VTR, 4 racks of tubes. TRT-1B (1959) Tube VTR, three racks. An available option for color expanded this machine to six racks, which included the color processing equipment and color monitor. TR-2 (1960) Tube VTR with some solid state. Low band or monochrome. TR-11 (1961) Tube VTR with solid state PS-Power supply. TR-22 (1961) Monochrome low band, later color version. TR-2 (1964) Record-only solid state. TR-3 (1964) Playback-only solid state. TR-4 (1964) Both, solid state. TR-5 (1964) Console portable solid state. 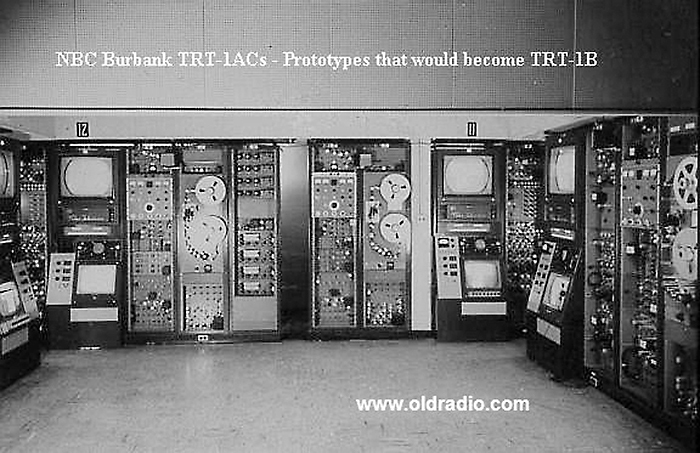 TR-70C (1967) TR-70 with digital TBC. TR-50 (1967) TR-4 high band. TR-60 (1969) High-band & low band color or monochrome. TR-60 is an updated TR-50. RCA's multi-standard machine 405/525/625 lines. The TR-60 and TR-70 were used in a master/slave configuration with the TCR-100 cart machines timesharing the video processing circuitry of the TR-60 and TR-70 machines when a SPU was not installed with the TCR100. 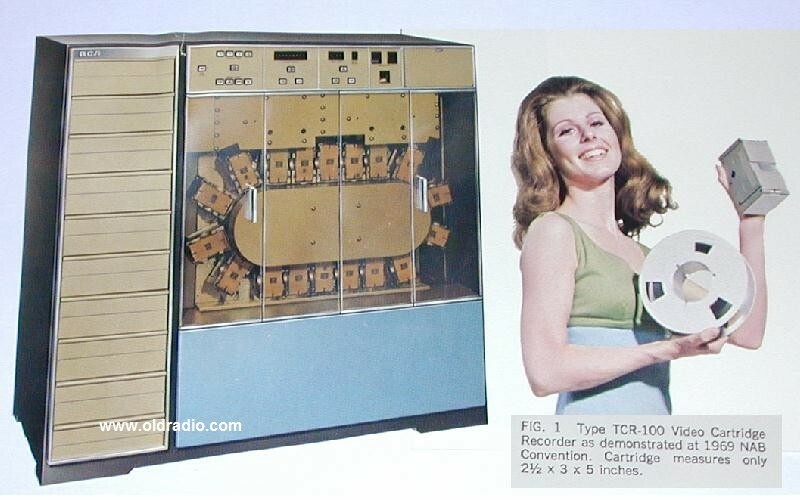 TR-61 (1972) High-band color, digital servo system, NTSC/PAL switchable, TR-60 is an updated TR-50. TPR-10 (1975) High-band color portable. Larger than a VR-3000, Had color playback, US air force use a few. TR-600 (1972) Last RCA Quad. Digital TBC, compact quad used in studios and remote trucks. BCM-40 (1970) Solid state, analog TBC. Кадр-1 (Kadr-1), B&W unit, tubes, 1961. Кадр-1Ц (Kadr-1Ts), color unit, tubes. Кадр-3П (Kadr-3P), 2 racks version of Kadr-3 intended for production trucks. (Note: Russian word «кадр» (kadr) meaning “frame”). Sony made an experimental 2" VTR in 1958, after seeing an Ampex VTR at NHK, but never sold any 2" quadruplex VTRs. WZT (Warszawskie Zakłady Telewizyjne, Poland) made VTR MW-623 (prototype in 1963) then improved to MW-645 (1965, commonly used in Polish Television) and finally 100% solid state MW-700C (1971). The VTRs were never sold abroad. Because the Ampex VR-3000 model was self-contained portable, the U.S. military used it in a wide variety of reconnaissance applications in various vehicles and aircraft. Its ability to accurately record a wide bandwidth of signals, especially high-frequency signals, was a definite advantage for signals intelligence applications. 2-inch quad is no longer used as a mainstream format in TV broadcasting and video production, having long ago been supplanted by easier-to-use, more practical and lower-maintenance analog tape formats like 1" Type C (1976), U-matic and Betacam. Television and video industry changes to digital video tape (DVCAM, DVCPro and Digital Betacam) and high-definition (HDCAM) are making analog tape formats increasingly obsolete. When it was in use, 2-inch quad VTRs required ongoing maintenance, usually 3-phase power or one phase 220 V to operate, plus an air compressor to provide air pressure for the air bearing that the spinning transverse headwheel rode on due to its high rotational speed (some quad VTRs, such as the portable Ampex VR-3000, used ball bearings instead due to the lack of availability of compressed air, but these wore out quickly). Operation of VR-1000-era machines required the skills of a highly trained video engineer. When a tape was changed, the operator spent as much as half-an-hour, "lining-up" the VTR — that is, carrying out specialized technical adjustments to calibrate the machine to the tape before it was ready for playback. From VR-1200/2000 onward, improvements in head manufacturing/refurbishing tolerances, timebase correction, and greater thermal stability of solid-state electronics made tape changes possible in under a minute and servo calibrations needed only once per shift. From AVR-1 onward, servos were self calibrating and tape changes as fast as the operator could articulate threading. 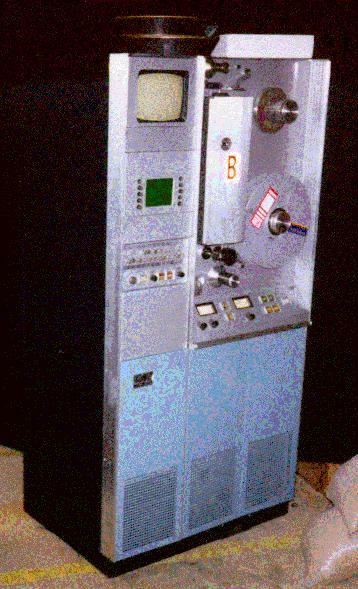 The few quadruplex VTRs which remain in service are used for the transfer and/or restoration of archival 2-inch quad videotape material to newer data storage formats, although mainstream TV serials from the 1950s to late 1960s have mostly already been remastered onto more modern media some years ago, even digitized within the last decade. ^ "Chapter 6 - All About Videotape". Retrieved 28 April 2016. ^ "Quad Videotape Group-Quad History-Page Index". Retrieved 28 April 2016. ^ "Chapter 5 - The VTR". Retrieved 28 April 2016. ^ "Videotape Formats". Retrieved 28 April 2016. ^ "Equipment Museum". Retrieved 28 April 2016. ^ "Chapter 9 - VTR Interchangeability". Retrieved 28 April 2016. ^ a b c Wolpin, Stewart. "The Race to Video Archived April 4, 2011, at the Wayback Machine". Invention & Technology, Fall 1994. ^ "History of Tape Recording Technology". Archived from the original on 3 June 2004. Retrieved 28 April 2016. 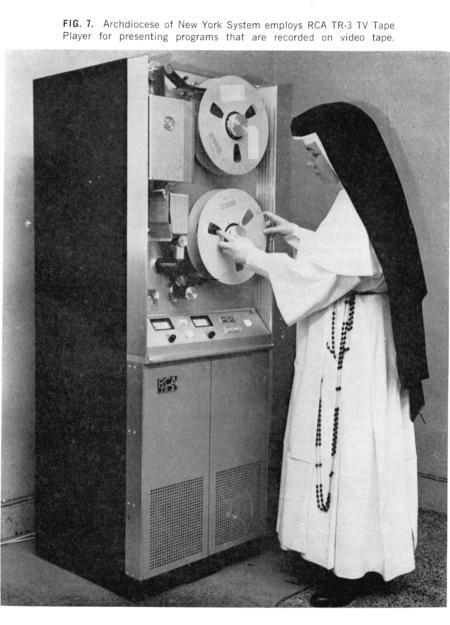 ^ "Ampex demonstrates videotape recording". Retrieved 28 April 2016. ^ "Chapter 14 - Maintenance, Troubleshooting, and Minor Repairs". Retrieved 28 April 2016. ^ "The First Videotape Machines at KRLD-TV". Retrieved 28 April 2016. ^ a b "Charles P. Ginsburg". Memorial Tributes: National Academy of Engineering, Vol. 7. 1994: The National Academies Press, Washington DC. ^ Val Adams, "C.B.S. Shows Off Tape-Recorded TV", New York Times, Dec 21, 1956, p. 43. ^ "Daily N.B.C. Show Will Be on Tape", New York Times, Jan. 18, 1957, p. 31. ^ "Ampex Quad Catalog". Retrieved 28 April 2016. ^ "VR-1000 VTR". Flickr - Photo Sharing!. Retrieved 28 April 2016. ^ "Ampex Video Recorder VR1000". Retrieved 28 April 2016. ^ "Ampex 2 Inch Helical Vtr". World News. Retrieved 28 April 2016. ^ "LabGuy's World: Ampex VR-3000 Portable Quadruplex VTR 40th Anniversary!". Retrieved 28 April 2016. ^ "$42,000 Ampex VR-3000 Camcorder from 1967". Retrieved 28 April 2016. ^ "1979 ACR Hemingway". Flickr - Photo Sharing!. Retrieved 28 April 2016. ^ "1995 - Lisa Fillingham with ACR-25 (VC2)". Flickr - Photo Sharing!. Retrieved 28 April 2016. ^ "RCA Quad Equipment Catalog". Retrieved 28 April 2016. ^ "RCA TRT-1 VTR". Flickr - Photo Sharing!. Retrieved 28 April 2016. ^ "Dave's Blog » Confessions of a Tape Head". Retrieved 28 April 2016. ^ "1971 VT area - Peter Partridge". Flickr - Photo Sharing!. Retrieved 28 April 2016. ^ "RCA TRT-1B VIDEO TAPE". Flickr - Photo Sharing!. Retrieved 28 April 2016. ^ "Western Australian Television History (WA TV History) » Blog Archive » Video Editing". Retrieved 28 April 2016. ^ "RCA TR-3 VTR". Flickr - Photo Sharing!. Retrieved 28 April 2016. ^ "A K Dart dot com - 404 Error". Retrieved 28 April 2016. ^ "Western Australian Television History (WA TV History) » Blog Archive » The Ron (DINGO) Reddingius Story". Retrieved 28 April 2016. ^ "RCA tr 600". Flickr - Photo Sharing!. Retrieved 28 April 2016. ^ Dipl. Ing. Gert Redlich Wiesbaden. "Fernsehmuseum1- Sie sind im Bereich : Fese BM-20 - 1963". Retrieved 28 April 2016. Video systems theory, with expanded information on the history of 2-inch Quad. Quadruplex Park, Museum of 2-inch Quad VTRs. The Edsel Show was the first TV entertainment program originating from the West Coast to be delayed for the West Coast on videotape. The History of Recording Technology, with a section with pictures on 2-inch quad and Ampex's development and introduction of it. The Birth of Video Recording. Promotional kinescope extolling the benefits of producing commercials on videotape instead of film. CED Magic's page on 2" quad. Color Television History page about early Color VTR. Quad Videotape Group, helping to preserve the content, machines and the knowledge to use them in conjunction with the Library of Congress. Has historical information and discussion list. U.S. Patent 2,866,012 "Magnetic Tape Recording and Reproducing System", Ampex patent filed May 1955, issued December 1958. This page was last edited on 23 February 2019, at 17:24 (UTC).